Reports of a Lesser Yellowlegs reach me as I open up at work. Damn. I'll be here till 5pm. I arrange to catch a lift there with my Dad and his cameras when I finish and get on with another busy day at work. More reports come in. The bird has gone and the hide is full of twitchers. Standing room only. I begin to doubt the wisdom of a dart there after work. It's the end of a long week, I'm tired and there are fajitas for tea. I love Mexican. But we are committed now so lets go for it. We arrive and the car park is pleasingly only sparsely populated with vehicles (most bearing the stickers of many birding groups and societies). This is a good sign. OK, so it means the rarity has gone but I quite fancy hunkering down in the hide and seeing what the regulars are up to. We wend our way down to the hide and settle in. Still no sign of the Yellowlegs, but by this time I don't care. Watching the waders and wildfowl going about their daily business is the perfect tonic to a hectic week. 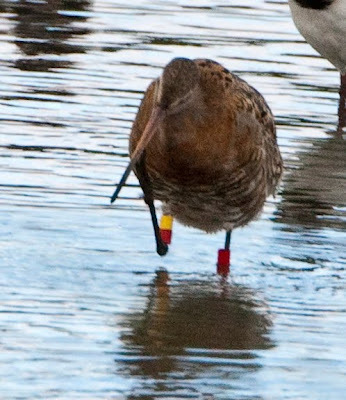 There are Black-tailed Godwits, about 40, many in stunning summer plumage. A more detailed scan of the islands on the Hide Pool reveal 2 Ruff and a solitary Dunlin still with the black belly patch of it's breeding dress. Soon a Green Sandpiper comes hurtling in and before we leave it is joined by 2 more. An Oystercatcher guards 2 chicks from hungry Herons. 5 Snipe zoom over from No. 1 pool and disappear into the reeds. The Lapwing are as nervous as usual. After careful searching through the Godwits I spy one with colour rings on it's legs. This is a real obsession of mine and I watch it in the scope until it moves into shallower water and I can see all 4 rings. I note the code and a quick text gets the info out to fellow colour ring enthusiasts. This rounds off an excellent evenings birding! All too soon our time is up and we have to leave and as we head home I can't believe that I was so close to calling the whole trip off and going home early. Sometimes you have to commit to your plans!